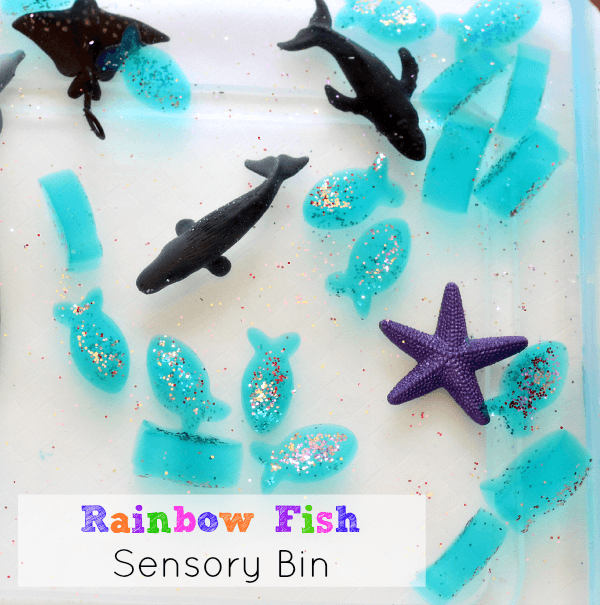 This Rainbow Fish ocean sensory bin was a fantastic activity to go along with the book. My son loved digging in and playing with the slippery rainbow fish! Lately, we have been reading a lot of books about the ocean and fish. My son really liked the book Rainbow Fish Discovers the Deep Sea (affiliate). 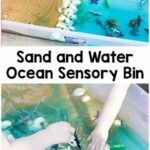 So I thought I would make him some Rainbow Fish and add them to an ocean sensory bin. 1. I followed this slippery fish recipe from Twodaloo. 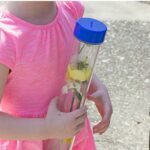 All you need is gelatin packets, water and food coloring and a bit of oil or cooking spray to make her recipe. 2. 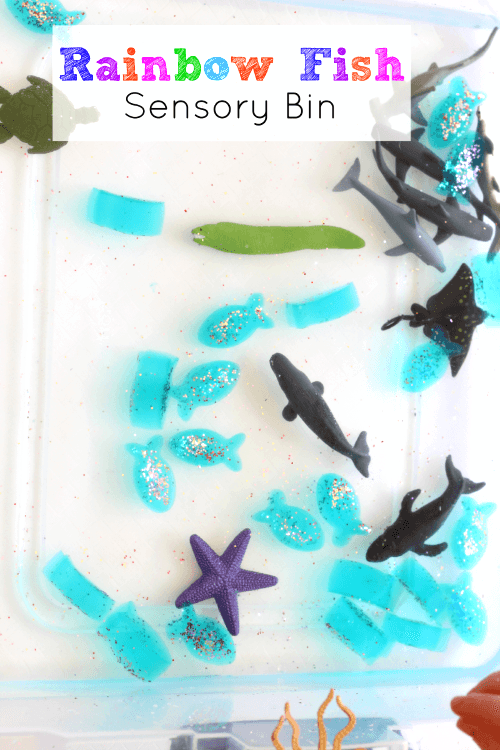 I added glitter to the gelatin mixture before pouring it into the fish molds. I was able to fill 3 trays. As I poured the gelatin into the ice cube tray, I noticed that the glitter was settling to the bottom of the tray. I thought it would be better if the glitter was on both sides, so I added more glitter to the tops of all the fish before putting the tray in the freezer. In hindsight, I would skip adding the glitter to the top. It just stuck on the surface and when the fish went in the water the glitter came off that side pretty quickly. However, the glitter on the bottom did not. It was in the gelatin. They still looked awesome with the glitter on one side, so I will stick with that next time. 3. 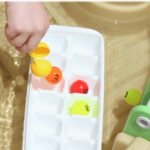 Put the ice cube trays in the refrigerator for many hours. 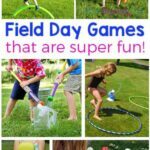 I left mine for 24 hours and had no problems with them dissolving during play. 4. Put very cold water in the bin you are using. This will also prevent the fish from dissolving. 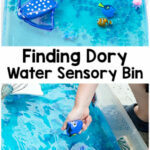 Add the slippery fish to the bin and any other ocean animals you would like. 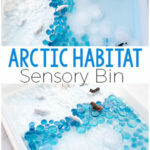 We read Rainbow Fish Discovers the Deep Sea and then I invited Evan to play with the sensory bin. He was so excited when he realized the bin was full of slippery rainbow fish. 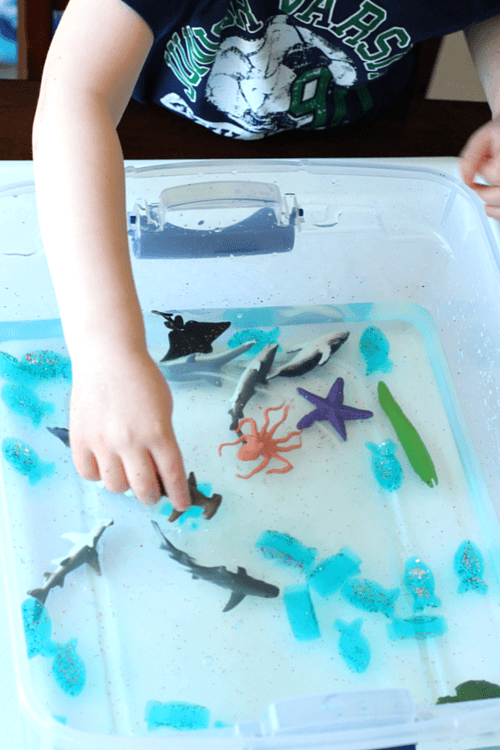 He spent a long time playing with all of the ocean animals and even acted out certain parts of the story. It was nice to see how many details from the story he retained.